Apple's smartwatch-related announcements on Monday, including a price drop, reveal a clever adjustment to slow sales in 2015 for the entire smartwatch category, analysts said. The biggest news: Apple announced a $50 price cut to $299 for its entry-level 38mm Apple Watch Sport model, along with several new watchband colors. 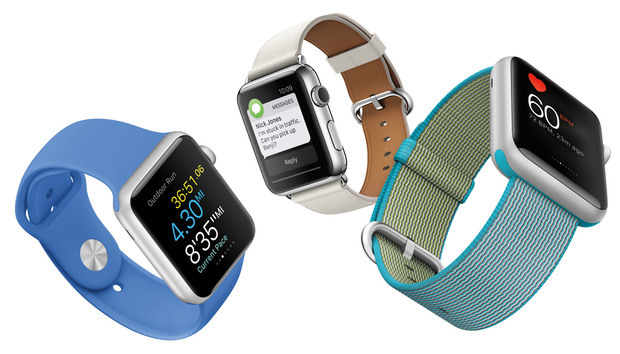 The stylish woven nylon bands will cost $49 apiece when purchased separately from Apple. The 42mm Sport model was also reduced by $50 to $349. Possibly more important, Apple didn't announce a second-generation Apple Watch, even though many observers thought Apple would do so. The unveiling of a new watch is now expected in June or July, with sales timed for the fall. Apple Watch 2, or whatever it is finally called, is expected to be thinner and faster than its predecessor. The device also is likely to include standalone wireless capability, perhaps with LTE or 3G, to supplement Bluetooth and Wi-Fi connectivity, several analysts said. The entry-level Apple Watch price cut came as Apple also expanded its focus on health and medical research apps. The Apple Watch can soon be used with the iPhone to help users actively manage their own medical conditions such as Parkinson's disease through a new software framework called CareKit, the company announced. Expanding health apps, a cheaper smartwatch entry price and the addition of colorful, fashion-oriented wristbands were wise moves on Apple's part to expand its smartwatch popularity. Even as Apple CEO Tim Cook noted that the original Apple Watch, which first went on sale in April 2015, had reached the status as the No. 1 selling smartwatch in the world, the claim probably wasn't all that meaningful, analysts noted. That's because smartwatch sales by various vendors were well below initial projections. Gartner's initial projection of 40 million smartwatches of all brands sold in 2015 was 33% higher than the 30 million that actually sold. And Apple shipped just 13 million smartwatches in 2015, IDC said, below the 21 million the research firm had projected earlier that year. IDC's claim was also well below other analysts' projections that Apple Watch sales would reach as many as 40 million. In January, at CES, a Samsung official admitted that the smartwatch market was moving slower than many expected. But Apple hasn't taken that tone. Cook noted Monday that Apple Watch customers are satisfied and see the devices as an "essential part of their daily lives. " Users are responding to messages from their Apple Watches and tracking their activities and getting up-to-date information, he said, "People also love changing the bands," he said, noting that one-third of Apple Watch wearers switch their watchbands. To buy a new band alone, in addition to the band that comes with the $299 Sport starting price, customers will shell out $49 for each new woven nylon model, including one in a "scuba blue" color. There's also a new Milanese Loop band, made of woven stainless steel mesh, for $149. Analysts predicted that Apple will more than make up on its $50 price cut for the Sport model with customers who buy a second band, since so many buyers view the smartwatch as a fashion item. For the $49 fluoroelastomer (a kind of rubber) sport band, Apple's cost is probably just "several dollars," said Patrick Moorhead, an analyst at Moor Insights and Analysis. "If you think of how much profit they are making on those bands, it's astronomical," Moorhead said. In addition, Apple is possibly generating 50% profit on each Watch it sells, he and other analysts said. But Moorhead said the $50 price drop also makes sense for a new category of product. "It is a challenge to price it, since it's a combination of demand and how much profit you need to make, so it takes a while to figure out that price point," he said. Moorhead is a big fan of smartwatches and owns 16 models from various makers. He said his personal Apple Watch has five different bands. Meanwhile, if the health-care management capabilities of the Apple Watch catch on, there might be potential for an even lower price on future entry level Apple Watches. "Fitness and health matter a lot to users of wearables in China," said Carolina Milanesi, chief of research at Kantar WorldPanel. "To matter to Apple and researchers, hospitals and such, you need to have mass market usage, which is why building from the iPhone first makes sense. Once users of health apps and organizations start to rely on that, the switch to the extra benefits of the Watch will be easier." Moorhead, as well as analysts from Gartner and IDC, see steady growth for smartwatches of all brands in coming years, despite the slow start in 2015. But there are a few who have doubted the category from the start, noting that people need a strong reason to buy a smartwatch, beyond it being a fashionable, status item. "Apple's price drop speaks to making Apple Watch more appealing to the mass market, where consumers remain unsure about the value of wearables," Milanesi added. "It's also a clever move if you think that with the savings of $50, consumers can buy an extra band — something that we see consumers do often at point of purchase." She said the price drop puts pressure on Samsung and even traditional fashion watch makers that are producing smartwatches to lower their prices. "The move will certainly put pressure on the competition and moreso on Fitbit, which has been the predominant player on the lower prices," Milanesi said. While lower prices will lure in more buyers, there are still basic concerns about the overall smartwatch market. "A year into the Apple Watch certainly hasn't lit the world on fire," said Kevin Burden, an analyst at 451 Research. "This drop in price is because the market is not making smartwatches indispensable to users. Apple looks at the year-end holiday period for the largest sales of the year, and the reality is that in the fourth quarter of 2015, their smartwatch barely sold during the holiday, and what sold better were [low-cost] fitness bands, which says it is a pricing issue." Burden added: "At least Apple didn't kill the Watch and [instead] dropped the price and added new bands. It was a secret admission by Apple that it has more work to do on Watch 2, which has to have more functionality that makes it more for the every day user and not just a nice-to-have product." He continued: "Apple didn't want a Watch 2 that was only a tick better than the original Watch. They know that users look at smartwatches the same way they look at first model-year cars: you don't buy a new car model in the first year. So Watch 2 should sell better and Apple realizes that."